One year during our time on our farm, one of our neighbours acquired 4 white ducks. Whether for pets or meat I’m not sure. They were kept in an enclosure behind the neighbour’s house, at the end of his driveway. After a month or so, the ducks somehow divined that there was a tempting wet area behind our house – a fair distance away for flightless ducks. They found a way out of their enclosure, waddled out their driveway and down the road to the reedy pond behind our house, where they spent the day swimming before returning home as evening approached. This became a daily routine for the ducks, until the script changed. I should mention that there was a fox den on our property. The property previously had been operated as a poultry farm, with 2 big barns and smaller outbuildings all being used for laying hens, so a resident family of foxes wasn’t a huge surprise. Although we saw the occasional fox gliding gracefully along the edge of our fence line, their den was situated beside a well-stocked wooded area, where they spent most of their time. That is of course until four well-fed ducks came to visit. Sitting ducks, one might say. The four ducks, free from their enclosure, set their sights on the inviting wet spot. They walked out their driveway, down the road, past a barn into a long driveway, down the hill behind a white house, and finally settled themselves into the cool, refreshing water. They couldn’t believe how nice it was there compared to being cooped up in their dusty, boring enclosure. They spent the day paddling around the shallow but expansive wetland, nibbling happily on tender water plants and bugs. At supper time, they reluctantly left their watery paradise and retraced their steps back to their enclosure. 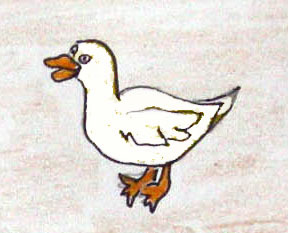 This became the pattern of choice for the duck quartet. They passed the lazy days of summer paddling around this watery haven, occasionally venturing close to its far edge, the edge that happened to be ominously close to a fox den. And, unbeknownst to the ducks, their activities were being observed with great interest by Mr. Fox. He watched and waited and then one day luck was on his side. One of the more curious ducks, Dorothy, came swimming all alone over to the far edge. Mr. Fox camouflaged himself in the reeds at the water’s edge, waited patiently and, lo and behold, Dorothy Duck swam right into his waiting mouth. 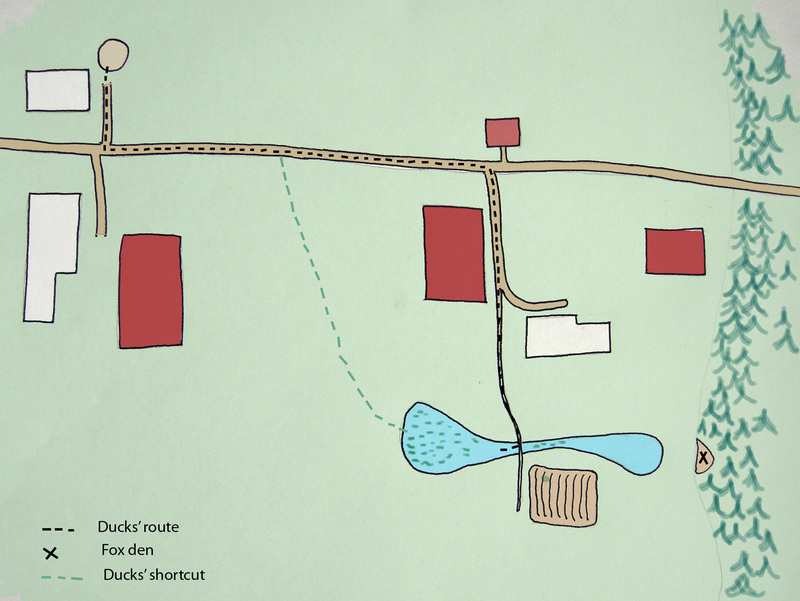 The remaining three ducks were swimming at the other end of the pond and never saw a thing. When they realized that Dorothy was missing, they decided that she must have made her escape. They knew they weren’t that brave, so headed back up the road to their enclosure before their caregiver came home to give them their supper. The three remaining ducks walked up the road and then returned again the next day. One of the three, Clarissa Duck, thought to herself, “I wonder if I swam over to the far edge I could find the escape route that Dorothy found.” She swam over while the others were busy catching bugs at the other side. The fox was lying in wait, hoping that he could get lucky again. Success! When the remaining two ducks noticed that Clarissa had disappeared as well, they were a bit suspicious. Were their friends playing a trick on them? Had they found a hiding place? Was there a danger at the other end of the pond that they hadn’t recognized? They weren’t sure, but, being conservative in nature, they decided they should go home to their enclosure before their caregiver came home to give them their supper. The two remaining ducks waddled up the road and then returned again the next day. Beatrice Duck thought to herself, “I wonder if Clarissa and Dorothy have found an even better spot over past the far edge. I’ll go check when Abigail isn’t looking.” So she bided her time until Abigail Duck was busy nibbling on tender plants and then swam over to the far edge. The fox couldn’t believe his good luck. Had these ducks not noticed that they had been four, then three, then only two? Weren’t they worried? But who was he to complain. His only concern was that he had a bit of heartburn from so much duck! 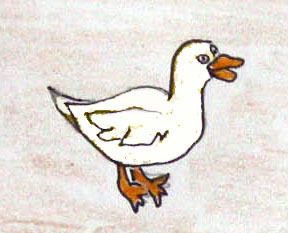 When Abigail Duck realized that she was all alone, she was very upset. How could Beatrice abandon her, knowing that she’d be left alone? She swore to herself that when they came back – and she was sure they would – she wouldn’t speak to them. Meanwhile, being a dutiful duck, she headed back up the road to her enclosure before her caregiver came home to give her her supper. The one remaining duck plodded up the road and then returned again the next day. Abigail Duck thought to herself, “I’m the one who first suggested we try out this pond, and now everyone but me has discovered a new and even better place.” Although she felt she had a responsibility to her caregiver to return, she decided she owed it to herself to at least check out the far edge. So she paddled over to the far edge, all the while grumbling to herself about having been left behind by her friends. Being preoccupied, she didn’t notice the furry red tail sticking out from behind the reeds. She swam to the edge … right into the mouth of the fox. Moral of the story: Patience is a virtue … or … All good ducks come to he who waits. Or … from the caregiver’s perspective: A fool and his ducks are soon parted. This entry was posted in Fables, Farming and tagged Creativity, drawing, ducks, fables, farming, fox, hobby farming, inspiration, Writing for children. Bookmark the permalink. Learn how to count, I like it!! Thanks, Jane.